To Cite: Amini M, Mirmoezzi M, Salmanpour M, Khorshidi D. Eight Weeks of Aerobic Exercises Improves the Quality of Life in Healthy Aged Sedentary Men, Int J Sport Stud Hlth. 2018 ; 1(1):e67514. doi: 10.5812/intjssh.67514. Objectives: Advancements in health care systems and technologies have lowered the rate of mortality leading to an accelerated increase of aged population in Iran and worldwide. Therefore, the aim of the study was to investigate the effect of aerobic exercises on quality of life in healthy aged sedentary men. Methods: In this randomized controlled trial, 26 healthy aged men living in Qazvin nursing home participated voluntarily and were randomly assigned in two experimental (n = 13) and control (n = 13) groups. The experimental group performed aerobic exercise protocol three sessions a week for two months. The quality of life was assessed Using SF-36 health survey before and after exercise intervention. The data were analyzed by paired and independent t-tests. Results: The results suggested that quality of life was improved significantly after exercise program (P = 0.001), while no significant change was found in the quality of life in the control group (P = 0.34). Conclusions: Taken together, 8 Week of aerobic exercise program significantly improves the quality of life among the aged persons Additional research with a greater number of subjects and different exercise protocols are required to make crucial decisions regarding the effectiveness of similar exercise programs on aged persons. Advancements in health care systems and technologies have lowered the rate of mortality leading to an accelerated increase of aged population in Iran and worldwide. Considering the importance of health care maintenance in aged persons as a social necessity, the elder mistreatment has been extensively increased (1). Based on world health organization report, the increased global population of aged persons is projected to be more than double by 2050 especially in developing countries (2) which show the remarkable life expectancy globally (2). In this regard, Aging is rapidly progressing in Iran which necessitates daily nursing care in this group age. The increase in longevity along with keeping the aged populations physically and mentally health is of utmost importance for health objectives (3). Some studies have supported the notion that regular exercise can mitigate the negative effects of degenerative changes of aging on physiological and psychological functions (4). Some investigations have been conducted to study the importance of quality of life in aging. It was shown in a study that aged individuals with regular exercise had less cognitive decline after 2.5 years (5). Health professionals especially sport sciences practitioners have recently implemented different exercise Protocols to reduce the need for nursing care. In the research literature, the effects of different exercise programs on different aspects of physical, physiological and psychological performance of aged persons with health problems have widely been studied (6-9), while considering the issues such as quality of life in healthy older adults is insufficient. Given the importance of health management in the healthy aged people, the research was to investigate the effect of 8-week selected aerobic exercise on quality of life in healthy sedentary aged Men. In this randomized controlled trial, 26 healthy aged men (aged 60 - 75 years) of over 200 individuals living in Qazvin nursing home who agreed to participated in the study, were invited to the study and randomly assigned in two experimental (n = 13) and control (n = 13) groups. Inclusive criteria were a, independency in carrying out daily tasks; b, healthy vision; c, no history of falling over the past year; d, lack of dislocation or chronic arthritis problem; and e, no dizziness. The experimental group performed aerobic exercise protocol three sessions a week for two months. The exercise program is presented in Table 1. Moreover, general health including the absence of any heart disease, diabetes, respiratory problems, blood pressure and organic problems were checked, and the health permission was issued by the physician of the nursing home. The quality of life was assessed Using SF-36 health survey as a standard tool (10) before and after exercise intervention. The tool consisted of 36 questions regarding the physical and social functioning, emotional roles, mental health, vigor and vitality, physical pains and general health (11). Furthermore, SF-36 assesses two major domains including physical and mental functioning. The scores on the SF-36 is in the range of 0 - 100 with higher scores indicating better state in quality of life. The validity and reliability of the SF-36 was confirmed with an appropriate validity and reliability in Iranian population (12). The internal consistency coefficients for the total questionnaire were ranged from 0.70 to 0.85 showing good and acceptable level and the test-retest coefficients with one-week interval were reported as 0.43 to 0.79. Paired and independent t-tests with a significance level of P ≤ 0.05 (SPSS Inc., Chicago, Ill., USA) were conducted to determine whether the differences between the two groups could be significant after aerobic exercise treatment. Comparing the general characteristics in the two groups in baseline (Table 2), the results showed no significant difference between the age, height, and weight factors (P > 0.05). aData are given as means ± SD. Kolmogorov-Smirnov test was conducted to test the normality of distribution before further analysis. The test showed that all variables of quality of life had normal distribution (P ≥ 0.05) (Table 3). Then, paired-t-test was used to analyze the data. The results are shown in Table 4. 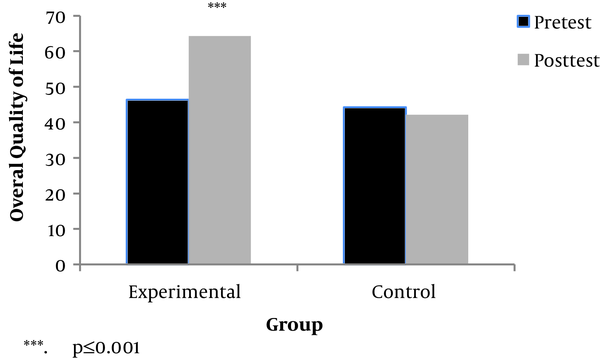 Whereas the experimental group increased their scores in all the variables of quality of life (P < 0.05), the control group had no significant change (P > 0.05). As it can be seen in Table 5, a significant difference was found between quality of life in the two groups in post-test (P = 0.001). Although the positive effects of exercise on quality of life in unhealthy aged people are well documented, the necessity for keeping the healthy ones into safe condition still exists. Therefore, the purpose of the research was to investigate the effect of eight-week aerobic exercises on quality of life in healthy aged sedentary Men. In this regard, the different modes of aerobic exercises have been widely used to improve the factors affecting the quality of life in aged people. The results confirmed the hypothesis that 8 weeks of aerobic exercise program significantly improves the overall quality of life in line with physical and mental functioning in healthy aged sedentary men. It can be stated that Aerobic exercises can increase the aged potentials to perform their daily tasks (13). The findings demonstrate that regular walking and slow running improves quality of life physically and mentally, then it can be adopted by health specialists as a safe and cheap strategy. One possible explanation for given results could be attributed to the positive effect of walking on cardiovascular fitness, stress control, and weight control (2). Consistent with our study, Leinonen et al., and Chodzko-Zajko l suggested that regular aerobic exercise improves the quality of life in older adults (14, 15). Furthermore, Brach et al. showed that daily exercise with medium intensity (20 - 30 minutes) contributes to reduce activity limitations, increase role-playing, and hence, increase the quality of life and well-being among the aged persons (16). The study of Guttierrez et al. indicated that exercise can increase the quality of life among aged ones (17). Dehkordi, and Borzoo conducted the same study on the old people living in the nursing homes of Borujen, Shahrekord, and Ahwaz, and indicated the effectiveness of intervention on the quality of life (18, 19). On the contrary, Barrett et al. showed no significant effect of anaerobic and resistance exercises on the quality of life (20). Different methodology and training protocols can be a possible reason for these convergent results. Despite many studies on this issue, few studies investigated the effectiveness of aerobic exercise on the aged persons with no special diseases. Since aerobic exercises such as walking and slow running are low-cost, easy to do and accessible, the aerobic exercises are highly recommended for healthy sedentary aged people in order to provide them with healthy. This research presents several limitations. The main limit is probably due to the low number of subjects participating in the study. Another critical point is related to different psychological fluctuation in aged persons and also their different nutrition status which must be further considered in future research. Conclusively, an 8-Week of aerobic exercise program significantly improves the quality of life among the aged persons. Additional research with a greater number of subjects and different exercise protocols are required to make crucial decisions regarding the effectiveness of similar exercise programs on aged persons. We appreciate all the staff working in the nursing homes Nikan, Amir-al-Mo’menin, and dear aged, who generously helped us in conducting the project. 1. Irandoust K, Taheri M. The impact of yoga and pilates exercises on older adults [In Persian]. Iran J Ageing. 2016;11(1):152-61. doi: 10.21859/sija-1101152. 2. Taheri M, Irandoost K, Yousefi S, Jamali A. Effect of 8-week lower extremity weight-bearing exercise protocol and acute caffeine consumption on reaction time in postmenopausal women [In Persian]. Iran J Ageing. 2017;12(1):16-27. doi: 10.21859/sija-120116. 3. Gillies E, Aitchison T, MacDonald J, Grant S. Outcomes of a 12-week functional exercise programme for institutionalised elderly people. Physiotherapy. 1999;85(7):349-57. doi: 10.1016/s0031-9406(05)67187-8. 4. Bherer L, Erickson KI, Liu-Ambrose T. A review of the effects of physical activity and exercise on cognitive and brain functions in older adults. J Aging Res. 2013;2013:657508. doi: 10.1155/2013/657508. [PubMed: 24102028]. 5. Aichberger MC, Busch MA, Reischies FM, Ströhle A, Heinz A, Rapp MA. Effect of physical inactivity on cognitive performance after 2.5 years of follow-up. GeroPsych. 2010;23(1):7-15. doi: 10.1024/1662-9647/a000003. 6. Nikpour S, Haghani H. The effect of exercise on quality of life in postmenopausal women referred to the Bone densitometry centers of Iran University of Medical Sciences. J Midlife Health. 2014;5(4):176-9. doi: 10.4103/0976-7800.145156. [PubMed: 25540567]. 7. Tavares BB, Moraes H, Deslandes AC, Laks J. Impact of physical exercise on quality of life of older adults with depression or Alzheimer's disease: a systematic review. Trends Psychiatry Psychother. 2014;36(3):134-9. doi: 10.1590/2237-6089-2013-0064. [PubMed: 27003844]. 8. Puciato D, Borysiuk Z, Rozpara M. Quality of life and physical activity in an older working-age population. Clin Interv Aging. 2017;12:1627-34. doi: 10.2147/CIA.S144045. [PubMed: 29042763]. 9. Ojagbemi A, Akin-Ojagbemi N. Exercise and quality of life in dementia: A systematic review and meta-analysis of randomized controlled trials. J Appl Gerontol. 2017. 10. Ware JJ, Sherbourne CD. The MOS 36-item short-form health survey (SF-36). I. Conceptual framework and item selection. Med Care. 1992;30(6):473-83. doi: 10.1097/00005650-199206000-00002. [PubMed: 1593914]. 11. Akbari Kamrani AA, Azadi F, Foroughan M, Siadat S, Kaldi AR. Characteristics of falls among institutionalized elderly people [In Persian]. Iran J Ageing. 2007;1(2):101-5. 12. Montazeri A, Goshtasebi A, Vahdaninia M, Gandek B. The Short Form Health Survey (SF-36): translation and validation study of the Iranian version. Qual Life Res. 2005;14(3):875-82. doi: 10.1007/s11136-004-1014-5. [PubMed: 16022079]. 13. Garber CE, Blissmer B, Deschenes MR, Franklin BA, Lamonte MJ, Lee IM, et al. American College of Sports Medicine position stand. Quantity and quality of exercise for developing and maintaining cardiorespiratory, musculoskeletal, and neuromotor fitness in apparently healthy adults: guidance for prescribing exercise. Med Sci Sports Exerc. 2011;43(7):1334-59. doi: 10.1249/MSS.0b013e318213fefb. [PubMed: 21694556]. 14. Leinonen R, Heikkinen E, Hirvensalo M, Lintunen T, Rasinaho M, Sakari-Rantala R, et al. Customer-oriented counseling for physical activity in older people: study protocol and selected baseline results of a randomized-controlled trial (ISRCTN 07330512). Scand J Med Sci Sports. 2007;17(2):156-64. doi: 10.1111/j.1600-0838.2006.00536.x. [PubMed: 17394477]. 15. Cowper W, Grant S. The effect of 12-weeks group exercise program on physiological variable and function in over weight persons. Public Health. 2003;191(12):617-23. 16. Brach JS, Simonsick EM, Kritchevsky S, Yaffe K, Newman AB, Health A, et al. The association between physical function and lifestyle activity and exercise in the health, aging and body composition study. J Am Geriatr Soc. 2004;52(4):502-9. doi: 10.1111/j.1532-5415.2004.52154.x. [PubMed: 15066063]. 17. Gutiérrez F, Masiá M. Improving outcomes of elderly patients with community-acquired pneumonia. Drugs Aging. 2008;25(7):585-610. doi: 10.2165/00002512-200825070-00005. 18. Hassanpour Dehkordi A, Masudi R, Naderi Poor A, Poormir Reza R. The effect of an exercise program on the healthquality of life in older adults [In Persian]. Iran J Aging. 2006;2(6):437-44. 19. Borzoo S, Arastou A, Ghasem-Zadeh R, Zahed-Nezhad S, Habibi A, Latifi S. Effects of aerobic exercise training on quality of life of elderly nursing home residents in Ahwaz city [In Persian]. Iran J Ageing. 2011;6(19):47-51. 20. Barrett CJ, Smerdely P. A comparison of community-based resistance exercise and flexibility exercise for seniors. Aust J Physiother. 2002;48(3):215-9. doi: 10.1016/S0004-9514(14)60226-9. [PubMed: 12217071].